I wanted to originally title this something much more hokey, akin to “Running With My Sister”, but an image of a mentally unwell Rosie O’Donnell came to mind. So scrap that, work with something else, I suppose. I am an amazing gift-giver. It’s true. When it comes to Christmas, I go straight for the jugular and bloody nail it. Maybe it’s an evolved response to far too many pair of socks as gifts (which is totally different than giving someone a gross (144 pairs) of white socks for a secondary gift. That was just entertaining. And practical.) but I like giving gifts with meaning. And she has trained, and she will come downtown tomorrow evening and see what big dorks my city folks and I are until the conclusion of the race outside of the field Saturday morning. I’m excited for a few reasons. First and foremost, my family is pretty good at claiming they will come downtown and visit or do something but back out at the last minute fairly frequently. So for her to follow through, pretty big. 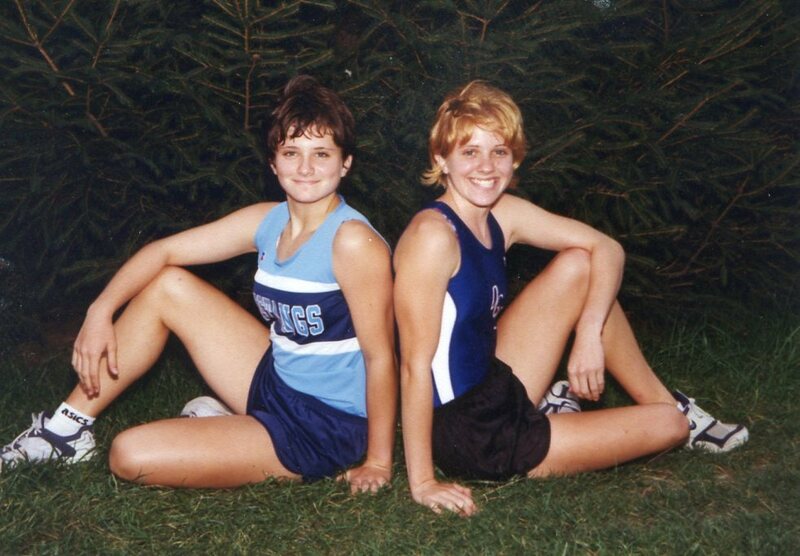 Secondly, and hey—a running-related (intended pun) facet of this blog!—it will be nice running with her for the first time since high school. 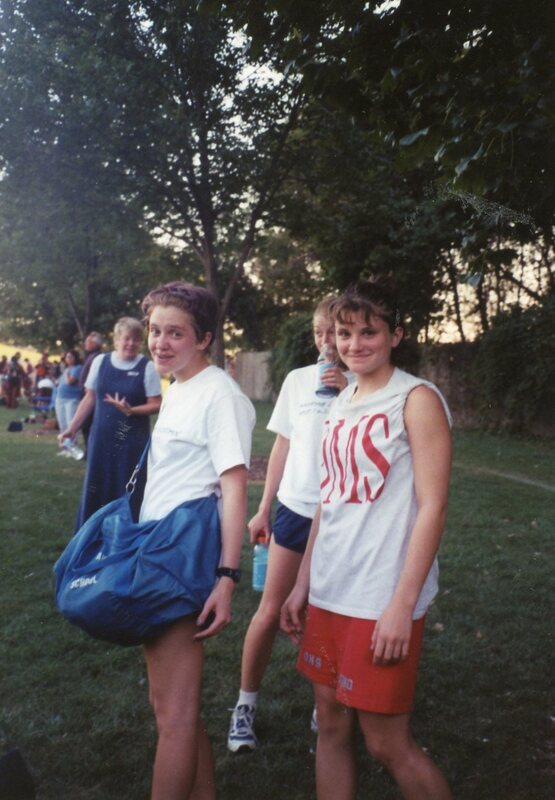 Cross Country, Fall 2001. Though not totally obvious, I am wearing the greatest shoes ever created, the 2000 Nike Pegasus. It's probably the reason for my crooked grin. Oh my god, I love(d) that shoe. She a freshman, I a senior. 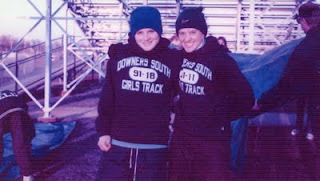 Always much more muscularly bound than I ever was, she was a strength-based runner and I always felt that she had all the tools to be faster than me, running a faster 800 time than I ever did in my first year running track in high school. Between the photo above (taken late August/early September) and this (February/March), my hair went from that strawberry blonde/orange to bleached to pink to kinda gray to brown to blonde. I dont know how my hair didn't surrender and leave my scalp. Probably because of my sweet Pegasus Trail shoes in this photo. I had some excellent snow runs that winter in those shoes. Seriously, it all went downhill after the 2000 model was F'd with. It is nice that we equally pale each other out. Whereas I put all my proverbial eggs into one running basket, she liked other things, placing mental interest and exertion in music, sciences and that variety eventually granted her entrance into the school where Tom Crean works (just a game note for an anonymous commenter, ‘tis all.) . She returned back to the suburbs to prepare for another go at graduate school this fall, entertaining herself with learning how to draw blood in the process. Snarling is an artform. Not sure why I look so evil. I ran a great 2 mile that day. Whereas my elder sister chose teaching and I…well, I really don’t know what I do most days, she has been focused and committed to a clinically-based field, be a coroner or a lab technician. That focus keeps her moving (don’t know how) towards her goals, be it further schooling or a job at a doctor’s office. Or on the road, on a run. I’m in awe and proud. Not to turn this towards me (too late), but I miss that inner drive that moves her from 5a until the end of a very late night of classes or studying. I remember what it felt like before I started crumbling on a daily basis, and I plan on regaining it bit by bit over this summer. Looking forward to her arrival tomorrow. Why yes, my hair IS purple. But look at those guns on her, always more muscle-y.